Home Affairs and Law Minister K. Shanmugam yesterday described the conduct of the Singaporeans - including historian Thum Ping Tjin - who recently met Malaysian Prime Minister Mahathir Mohamad as "sad and regretful". He was commenting on the group that met Tun Dr Mahathir in Putrajaya on Thursday, which included former student union leader Tan Wah Piow, Dr Thum, freelance journalist Kirsten Han, comic artist Sonny Liew, activist Jolovan Wham and Malaysian social activist Hishamuddin Rais. They invited Dr Mahathir to open a conference next year on the issue of opening up democratic space in South-east Asian countries. "But I think we should never go out and invite someone foreign, a foreign politician, to intervene in our domestic politics. I think that's an absolute no-no." After the meeting, Dr Thum wrote a Facebook post saying he had asked the Malaysian leader to "take leadership in South-east Asia for the promotion of democracy, human rights, freedom of expression and freedom of information". Dr Thum said he also expressed hopes for closer relations between the people of Malaysia and Singapore, and presented Dr Mahathir with a copy of a book, Living With Myths In Singapore, co-edited by him. Commenting on Dr Thum's post, Mr Shanmugam said: "I think it is quite clear what that means." She also said that Dr Thum's "happy unofficial independence day" wish to Singaporeans was not about declaring Singapore a part of Malaysia, but a reference to the Republic's history. In the memoirs of Singapore's founding prime minister Lee Kuan Yew, The Singapore Story, Mr Lee had recounted how he had unilaterally declared Singapore independent from the British on Aug 31, 1963, in line with his push for Singapore to become part of the Federation of Malaysia. The federation was established two weeks later on Sept 16, 1963. The merger proved acrimonious, over racial rights and representation as well as financial disputes, and culminated in the federal government expelling Singapore from Malaysia in August 1965. Since then, Singapore has marked Aug 9, 1965 as its independence day, while Malaysia regards Aug 31 as its Merdeka Day and Sept 16 as Malaysia Day. Pointing to Ms Han's post, Mr Shanmugam said: "Kirsten Han then puts up a post saying that that is for South-east Asia and not Singapore. Where is Singapore if it is not in South-east Asia? Do we need a geography lesson? "And we are not saying anything about Dr Mahathir but I think one needs to be careful with these things. And now to try and explain away what is so obvious doesn't do them much credit either." The minister also noted that Dr Thum and Ms Han had tried to register a company, OSEA Pte Ltd, earlier this year. "PJ and Kirsten are partners in a company they want to set up, which has taken foreign money, to also promote democracy, human rights and so on in Singapore, so this is not new. And I think it is all a bit sad," he said. In a Facebook post yesterday afternoon, Ms Han said Mr Seah's allegations have triggered "a torrent of accusations of treason" against the group. "We are also getting death threats," she wrote. Mr Seah had flagged a comment that Ms Teo had posted about a video of a forum on Aug 18 on The Online Citizen's Facebook page, in which she wrote that "Singapore is part of Malaya la". He said: "Really? This is what PJ Thum and Teo Soh Lung and the SDP (Singapore Democratic Party) believe in their heart of hearts?" Yesterday, Ms Teo wrote a lengthy post in response and said the statement she had made was accurate in a historical context and timeframe. She said she commented when Mr Hishamuddin was speaking about how the democratisation process in Malaysia began when the Federation of Malaya gained independence in 1957. She also said Mr Seah had "deliberately misinform (sic)" the public that she is an SDP member. "I am not and he knows that." Other participants in the meeting had earlier written about other aspects of their encounter with Dr Mahathir. Mr Wham said it was a fascinating experience overall, but added that some of Dr Mahathir's views - on Malays and lesbian, gay, bisexual and transgender rights - "are still very conservative and offensive". Ms Han, in turn, noted in a blog post that she "came out of the meeting with few answers but a little more clarity". "Although he's been talked up as a champion for democracy in Malaysia - don't we all love a clear-cut narrative - there are many ways in which Mahathir hasn't changed. He's still got his problematic views and stubborn positions, his own way of seeing things," she wrote. Mr Liew noted that "it was clear from the outset that the group was made up of non-establishment folks, and there was always the possibility of the optics playing out in uncontrollable ways". MP Seah Kian Peng yesterday called on netizens to maintain a certain decorum in their comments and "not get personal or abusive", in a new Facebook post about historian Thum Ping Tjin. 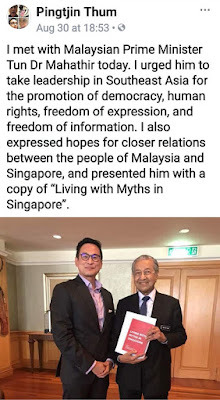 Mr Seah was following up on an earlier post about Dr Thum and freelance journalist Kirsten Han, who were part of a group that met Malaysian Prime Minister Mahathir Mohamad in Putrajaya last Thursday. In his initial post last Saturday, Mr Seah questioned Dr Thum for inviting Tun Dr Mahathir to bring democracy to Singapore. He also said "it appears quite clear to me that PJ Thum does not wish Singapore well". Several activists called on Mr Seah to retract his post, including Ms Han, who said his statements were "baseless" and had triggered "a torrent of accusations of treason" and death threats against the group that met the Malaysian Prime Minister in Putrajaya last week. Dr Thum, himself, said that the notion that he is a traitor to Singapore is "ridiculous and unfounded". Mr Seah yesterday noted his initial post had generated a number of comments, and thanked those who agreed with and backed his views. "Whilst we have different points of view... we can all agree to disagree and be civil about it," he wrote. "It is regretful that I see all kinds of abusive remarks that are made by many different individuals (and trolls) against each other. I do not support such types of comments, regardless of what views or positions they take." The MP did, however, apologise for wrongly assuming that former political detainee Teo Soh Lung was still a member of the Singapore Democratic Party (SDP). He had flagged a comment Ms Teo made on a video of an Aug 18 forum posted on The Online Citizen's Facebook page. She wrote that "Singapore is part of Malaya la", to which Mr Seah said: "Really? This is what PJ Thum and Teo Soh Lung and the SDP believe in their heart of hearts?" Mr Seah yesterday noted the SDP has stated that Dr Thum and Ms Teo are not its members. He said he assumed Ms Teo was still a party member as she had stood as an SDP candidate in the 2011 General Election. "I apologise for this wrong assumption and thank SDP for the clarification," he said. Dr Thum and Ms Han met Dr Mahathir last Thursday, along with political exile Tan Wah Piow, comic artist Sonny Liew, activist Jolovan Wham and Malaysian social activist Hishamuddin Rais. Home Affairs and Law Minister K. Shanmugam on Sunday described the conduct of the Singaporeans involved in the meeting as "sad" and "regretful". He said it is an absolute no-no to invite a foreign politician to intervene in Singapore's domestic politics. The minister also said "it is quite clear what that means" when Dr Thum wrote in a Facebook post that he had urged Dr Mahathir to "take leadership in South-east Asia for the promotion of democracy, human rights, freedom of expression and freedom of information". Defending himself yesterday, Dr Thum said: "I love my country and my people. "I believe democracy, human rights, freedom of expression and freedom of information will make Singapore and our world better." Referring to a talk he gave at a forum in Johor Baru on Aug 18, Dr Thum said he does not want Singapore to "do a Malaysia", but for "Singapore to do a Singapore". The solution to many of Singapore's problems, he said, lies with Singaporeans. "But that does not preclude us from learning from others' experiences to make our country better," he said, adding that "we can always aspire to improve the quality of our democracy". Local non-governmental group Community Action Network has put up an online letter saying Mr Seah is "propagating misinformation". It called on Mr Seah to apologise, retract his post and resign from the Select Committee on Deliberate Online Falsehoods, of which the MP is a member. A key date - Aug 31 - has become a bone of contention in a spat between activists and MP Seah Kian Peng. 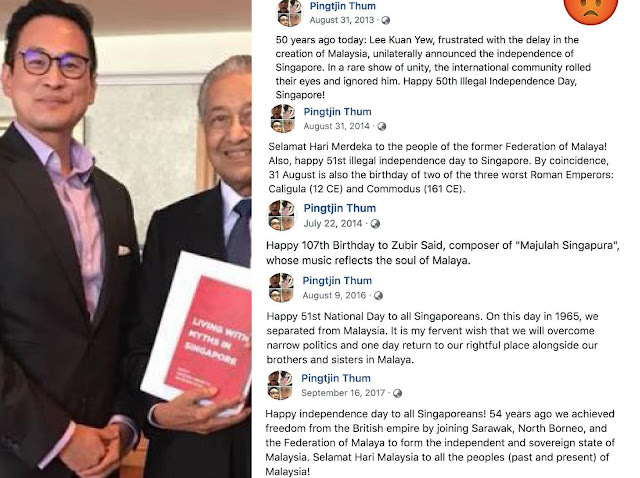 On Saturday, Mr Seah questioned historian Thum Ping Tjin for suggesting in his Facebook post that Singaporeans should rejoice and celebrate Singapore's unofficial independence day on Aug 31. He also wrote: "I am amazed that Dr Thum and his supporters should proclaim that Singapore is part of Malaysia (or Malaya)." Freelance journalist Kirsten Han, in her response, said Dr Thum was merely stating a historical fact since founding Prime Minister Lee Kuan Yew had actually declared Singapore's de facto independence on Aug 31, 1963. But few in Singapore are aware of this historical milestone, said Dr Leong Chan-Hoong, head of the Institute of Policy Studies' Social Lab, who led a study on the impact of historical events on national identity. "Few in the younger generation are aware of our historical journey towards independence in 1965. For many young Singaporeans, the notion of nationhood starts on Aug 9, 1965, when Singapore separated from Malaysia. To many Singaporeans, Aug 9, 1965, was the birth of a nation and the start of the Singapore universe," he told The Straits Times. But when history books say that Mr Lee had made a declaration of independence on Aug 31, 1963, it was in reference to independence from British rule, a move that was in line with his push for Singapore to join the Federation of Malaysia. As Mr Toh Cheng Seong wrote in a letter in today's Straits Times Forum page: "Singapore did not exist as a sovereign entity (on Aug 31) in 1963, but as part of Malaysia. Hence, we celebrated independence from British colonialism on Aug 31 for two years as Malaysians, and not as Singaporeans." He also said "our nation came into being as an independent city-state - from Malaysia - only on Aug 9, 1965, with all the sovereign rights of statehood which guarantee (the country) its seat at the United Nations". To proclaim Singapore's unofficial independence day as falling on Aug 31, which is Malaysia's Merdeka Day, is "absurd", Mr Toh said. Dr Thum had said on Facebook on Aug 31: "Selamat Hari Merdeka to the people of the former Federation of Malaya! (and happy unofficial independence day to the people of Singapore!)" Former Nominated MP Calvin Cheng, in a Facebook post on Sunday, echoed Dr Leong's thoughts. He also pointed out another significant event had taken place on Aug 31. That happened in 1957, when the Federation of Malaya - which did not include Sabah, Sarawak and Singapore - proclaimed independence from British colonial rule. Mr Cheng felt that the brouhaha about Dr Thum wishing "Malaya" Happy National Day and the people of Singapore an "unofficial independence day", is due to "a lack of knowledge about Singaporean history". MP Seah Kian Peng criticised historian Thum Ping Tjin yesterday, writing in a Facebook post that he is "amazed Dr Thum and his supporters should proclaim that Singapore is part of Malaysia (or Malaya)". Mr Seah's post came after Dr Thum, freelance journalist Kirsten Han, comic artist Sonny Liew and activist Jolovan Wham met Malaysian Prime Minister Mahathir Mohamad last Thursday. Mr Seah noted that they had "invited Dr Mahathir to bring democracy to Singapore, and suggest that Singapore is part of Malaya". "I wonder what deep historical insight prompted him to make this plea, to Dr M, whose views on the Water Agreement with Singapore, and Singapore knowing its place in relation to Malaysia are well known," wrote Mr Seah, who is MP for Marine Parade GRC. The group that met Tun Dr Mahathir at the Perdana Leadership Foundation in Putrajaya included Malaysian political and social activist Hishamuddin Rais, and former student union leader Tan Wah Piow, who fled Singapore in 1976 after failing to report for national service enlistment and was stripped of his citizenship in 1987. Dr Thum posted on Facebook about his meeting, saying he had asked the Malaysian leader to "take leadership in South-east Asia for the promotion of democracy, human rights, freedom of expression and freedom of information". The group also invited Dr Mahathir to open a conference next year on the issue of opening up democratic space in South-east Asian countries, and presented him with a document titled the Peoples' Charter For South-east Asia. Mr Seah then pointed out that Dr Thum had posted an unusual greeting on Facebook the day after the meeting with Dr Mahathir. "On August 31, Malaysia's national day, he posted an unusual greeting, 'Selamat Hari Merdeka to the people of the former Federation of Malaya', and suggested that Singaporeans should also rejoice on that day since it was Singapore's 'unofficial independence day'." Mr Seah also noted that Singapore Democratic Party (SDP) member Teo Soh Lung had written in a comment on a video on The Online Citizen's Facebook page: "Singapore is part of Malaya la". Mr Seah wrote: "Really? This is what PJ Thum and Teo Soh Lung and the SDP believe in their heart of hearts?" He added: "I'm amazed Dr Thum and his supporters should proclaim that Singapore is part of Malaysia (or Malaya). Perhaps that is why he thinks it is permissible to ask its current prime minister to interfere in our affairs. It appears quite clear to me that PJ Thum does not wish Singapore well." The Sunday Times has reached out to the SDP for comment. Mr Seah also wrote that Singapore's Constitution requires any change to the sovereignty of the Republic to be approved by two-thirds of all voters in a referendum. He noted that when moving this constitutional amendment in Parliament, Singapore's first Minister for Law and the author of the Separation Agreement, Mr E.W. Barker, said that "in the methodology of the destruction of a nation by its foes, war by force of arms is not necessarily the only means employed. The independence of a nation may, by more subtle means, be subverted". Mr Seah also quoted Mr Barker as saying: "The seductive blandishments of foreign agents must not be allowed to succeed." "Quite right and I am sure Singaporeans will agree with that," Mr Seah added. In a blog post last night, Ms Han said she was shocked by Mr Seah's post, adding that he appears to have misunderstood the nature of the meeting with Dr Mahathir. "PJ did not say that he asked Mahathir to bring democracy to Singapore, nor did I hear him say such a thing during the meeting," she wrote. She also said that the historian's "happy unofficial independence day" wish was "merely a reference to our own history", signifying the end of colonial British rule in Singapore. PUTRAJAYA - Activists aiming to open up democratic space in South-east Asian countries met Malaysian Prime Minister Mahathir Mohamad on Thursday (Aug 30) to invite him to open a conference next year on the issue. The group, which included Malaysian political and social activist Hishamuddin Rais, fugitive and former Singapore student union leader Tan Wah Piow, academic Thum Ping Tjin, and three other Singaporeans whom Tan said did not want to be identified, met Tun Mahathir at the Perdana Leadership Foundation in Putrajaya. The Straits Times understands that the three were Singapore activists Jolovan Wham, Kirsten Han and Sonny Liew. Dr Mahathir regularly uses his office at the foundation, an institution that holds information on the work of Malaysian prime ministers, for his meetings. Tan said after the 80-minute meeting that they discussed Pakatan Harapan's win at the May election, which he said "brought hope that change is possible in our lifetime through the ballot box". "Personally, I am grateful for this open, democratic space that Tun Mahathir's government has now opened, and is now a beacon for many struggling for democracy not just in Singapore, but also in other parts of South-east Asia," he added. Mr Hishamuddin, who lived in self-exile abroad for several years, and Tan, who fled Singapore in 1976 after failing to report for national service enlistment and was stripped of his Singapore citizenship in 1987, belong to a group called Forces for the Renewal of Southeast Asia. They also presented Dr Mahathir with a document titled Peoples' Charter For South-east Asia. Details of the charter were not made available immediately. Dr Mahathir and the Prime Minister's Office have not commented on the meeting, or whether he accepted the invitation to the conference. But Tan said the Malaysian leader agreed to attend so long as a suitable date could be found. He added that the conference aimed "to help the promotion of democracy in other parts of South-east Asia". "It is giving opportunities to other countries in South-east Asia to learn and to see how much of the Malaysian template... can provide an example for other countries." Mr Hishamuddin, who initiated Thursday's meeting, said there was a need to manage and defend the success of what was achieved at the May general election. "We see how People's Power in Manila ended in (Filipino president Rodrigo) Duterte's win. We saw in Indonesia there is government change, but not much change. In South-east Asia, NGOs and people see Malaysia as an example. We have to defend this... In the blink of an eye, it can be lost, as we have seen in the Philippines. The conference will talk about experiences in Laos, Vietnam, Cambodia, the Philippines and Indonesia, so that Malaysians can learn from these," he added. Asked if the Malaysian general election that toppled Barisan Nasional will influence voters in Singapore, Tan, who is based in London, said: "I hope so because Malaysians have pointed the way to Singaporeans that change is possible, change is not frightening." The meeting with Dr Mahathir was one of several Tan has had in Malaysia in recent weeks, going by his Facebook posts. He was at a panel discussion with Mr Hishamuddin and Dr Thum, among others, on Aug 18 in Johor, and visited Penang, Pahang and Kelantan. In 1975, the year before he fled Singapore, Tan and two others were found guilty of unlawful assembly, criminal trespass and rioting at the Pioneer Industries Employees' Union, and sentenced to a year in prison. Dr Thum posted on Facebook about his meeting and said he asked the Malaysian leader to "take leadership in South-east Asia for the promotion of democracy, human rights, freedom of expression, and freedom of information". Seen in any context, proclaiming Malaysia's Merdeka Day on Aug 31 as Singapore's unofficial independence day as well is absurd, because Singapore did not exist as a sovereign entity on that day in 1963, but as part of Malaysia. Hence we celebrated independence from British colonialism on Aug 31 for two years as Malaysians, and not as Singaporeans. Perhaps such clear lines between national identities, the past and the present, and the freedom to inform and misinform, can be hazy for those with shifting allegiances. But it should not be so for level-headed Singaporeans who can comprehend basic facts, including the very obvious one that our nation came into being as an independent city-state - from Malaysia - only on Aug 9, 1965, with all the sovereign rights of statehood which guarantee a little red dot its seat at the United Nations. Such international rights are not conferred on Malaysian states like Johor and Sarawak by the way, unless they also choose to leave the Federation one day, as certain quarters have alluded to in recent years. Whatever these differences may be, none of Malaysia's neighbours would view it as their place to arbitrate over an internal matter without an invitation by all concerned parties, as this would go against ASEAN's principle of non-intervention in the domestic affairs of fellow member states. Clearly an understanding of this basic etiquette seems lost on historian Thum Ping Tjin when he called on Malaysian Prime Minister Mahathir Mohammad to be the champion of democracy, human rights, freedom of expression and freedom of information across South-east Asia - a cause that has also seen him and some of his colleagues avail themselves to collaboration with other foreign entities to dabble in local issues here via the media. If Dr Thum really cares for Singapore as his colleague has claimed, he certainly has a strange way of showing it. Malaysian activists who wonder aloud presumptuously whether the dawn of "democracy" in their country will rub off in the same way for Singapore, should focus their energies on helping their government succeed in getting their own house in order first and foremost. Singapore does not need any foreigners, including our close neighbours, to show us how to run a tight ship, especially when we continue to do relatively well for ourselves on the global stage. Above all, Singaporeans should stay calm and not overreact to the stunts of some circus act. Retired diplomat Bilahari Kausikan yesterday questioned Dr Thum Ping Tjin's loyalties by referencing earlier Facebook posts made by the historian. He noted that Dr Thum and other activists met Malaysian Prime Minister Mahathir Mohamad last Thursday and invited him to "interfere in Singapore's internal politics". After the meeting on Aug 30, Dr Thum wrote that he had urged Tun Dr Mahathir to "take leadership in South-east Asia for the promotion of democracy, human rights, freedom of expression and freedom of information". A day later, the historian put up another Facebook post wishing Singaporeans a "happy unofficial independence day". 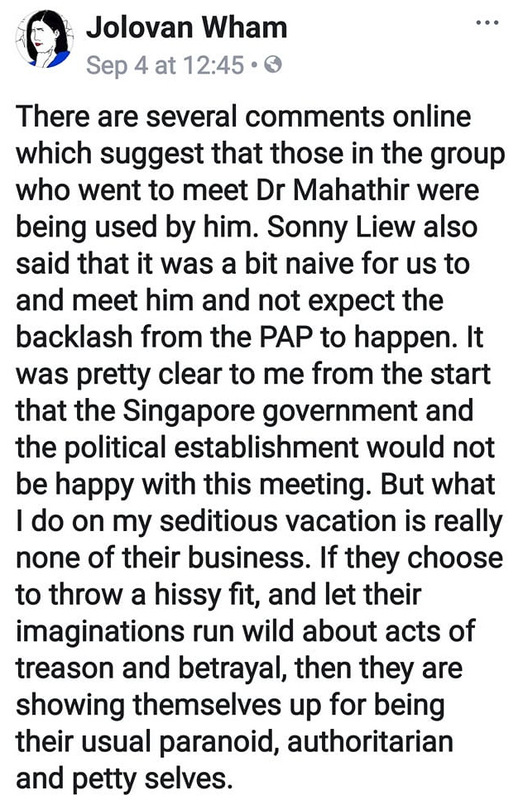 The group came under fire from some netizens after Marine Parade GRC MP Seah Kian Peng wrote in a Facebook post last Saturday that Dr Thum had invited Dr Mahathir to bring democracy to Singapore, and that "it appears quite clear to me that PJ Thum does not wish Singapore well". 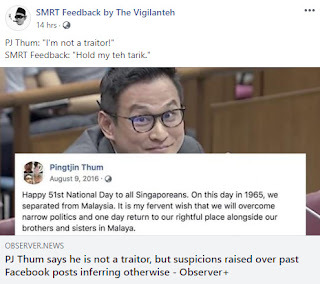 On Sunday, Home Affairs and Law Minister K. Shanmugam referenced Dr Thum's Aug 30 post on Dr Mahathir and said "it is quite clear what that means". The minister added that it is an absolute no-no to invite a foreign politician to intervene in Singapore's domestic politics. Defending himself on Monday, Dr Thum said any notion that he is a traitor to Singapore is "ridiculous and unfounded". He added: "I love my country and my people." Mr Kausikan asked a day later: "But which is his country and who are his people? Not a straightforward issue when dealing with a slippery character." The former ambassador-at-large pointed to several of Dr Thum's Facebook posts from 2013 to last year, which were shared on social media and in WhatsApp chat groups. On Aug 31, 2013, Dr Thum wished Singapore a happy 50th illegal independence day. Mr Kausikan, citing the historian's statement, said that "even for him, (it is a) remarkable distortion of history", and noted that Dr Thum used the same phrase again in a 2014 post. He added that Dr Thum had consistently referred to "Malaya" in his posts - "a loaded reference which, as a historian, he should recognise, and cannot be accidental". Mr Kausikan also noted that on Aug 9, 2016, Dr Thum wrote that "it is my fervent wish that we will overcome narrow politics and one day return to our rightful place alongside our brothers and sisters in Malaya". Malaya, comprising the states in the peninsula, became independent from British rule on Aug 31, 1957. It was only in 1963 that Sabah, Sarawak and Singapore joined the Federation of Malaya, which then became known as the Federation of Malaysia. 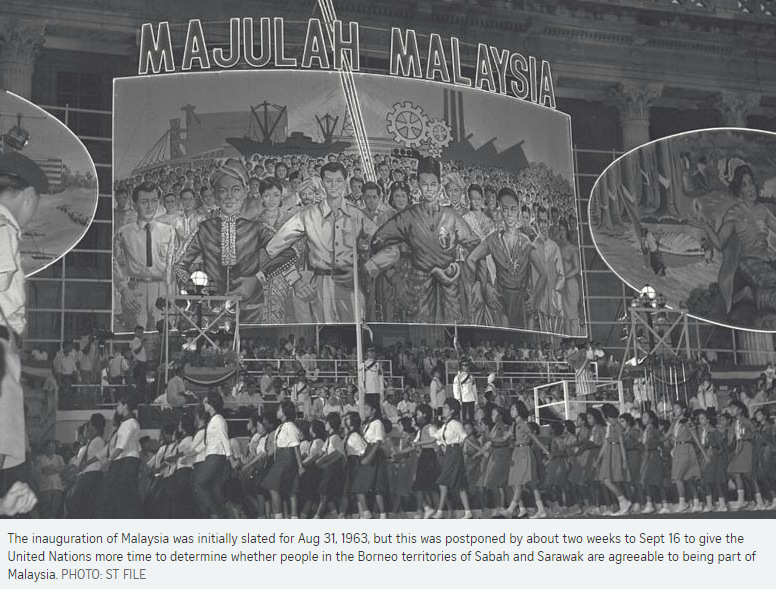 The inauguration of Malaysia was initially slated for Aug 31, 1963. But this was postponed by about two weeks to Sept 16 to give the United Nations more time to determine if the people of Sabah and Sarawak were agreeable to joining Malaysia. Mr Kausikan added that Dr Thum is "still twisting and turning, trying to slip out of what he has said and done". In comparison, graphic novelist Sonny Liew had publicly admitted he should have used better judgment over the meeting with Dr Mahathir, Mr Kausikan noted. "That is at least half-way honest." Dr Thum could not be reached for comment yesterday. Mr Liew, in response to questions from online news site Today, had written in a Facebook post on Monday that he and the rest who met Dr Mahathir were "much too wide-eyed and naive" in doing so. He said the meeting "was a perfectly innocent if rare opportunity in our own minds", and added that in retrospect, they should have asked a lot more questions and been a lot more prepared for potential pitfalls. Political activist Jolovan Wham said that from the start, it was "pretty clear" to him that the Singapore Government and political establishment would not be happy with the meeting he had with Malaysian Prime Minister Mahathir Mohamad recently. "But what I do on my seditious vacation is really none of their business," he added in a Facebook post yesterday. Mr Wham, with historian Thum Ping Tjin, journalist Kirsten Han and graphic novelist Sonny Liew, had met Tun Dr Mahathir last Thursday in Putrajaya. They were joined by political exile Tan Wah Piow and Malaysian social activist Hishamuddin Rais. Last Saturday, Marine Parade GRC MP Seah Kian Peng wrote in a Facebook post that Dr Thum had invited Dr Mahathir to "bring democracy to Singapore", and that "it appears quite clear to me that PJ Thum does not wish Singapore well". Ms Han responded to say Mr Seah's statements were "baseless", and called on him to retract them. On Sunday, Home Affairs and Law Minister K. Shanmugam told reporters it is an absolute no-no to invite a foreign politician to intervene in Singapore's domestic politics. Mr Wham, responding to the criticisms, said in his Facebook post that "lobbying an overseas politician on political and civil rights in your country is nothing new". "Activists all over the world do it. The most recent example that comes to mind is Hong Kong Occupy activists lobbying politicians in the United Kingdom and United States. International political pressure is part of activism," he said, referring to the territory's Occupy Central pro-democracy movement in 2014. "Even if PJ had asked Mahathir to 'bring democracy to Singapore'... what is wrong with that?" 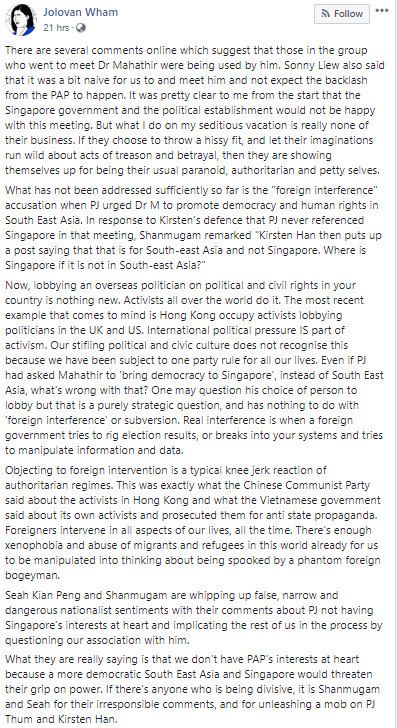 One may question Dr Thum's choice of person to lobby, but that is a purely strategic question and has nothing to do with "foreign interference" or subversion, Mr Wham said. "Real interference is when a foreign government tries to rig election results or breaks into your systems and tries to manipulate information and data." Mr Wham ended his post by saying: "If there is anyone who is being divisive, it is Shanmugam and Seah for their irresponsible comments, and for unleashing a mob on PJ Thum and Kirsten Han." Ms Han has said that she and Dr Thum have received death threats and accusations of treason since Mr Seah's Facebook post last Saturday. Mr Seah, in a new post on Monday, called on netizens to maintain a certain decorum in their comments and "not get personal or abusive". The Ministry of Home Affairs (MHA) has responded to three activists who had filed a complaint with the Prime Minister for what they charged were "highly irresponsible" remarks made by a government minister and an MP. In its reply, MHA said the three had "crossed a red line by inviting foreign leaders to intervene in Singapore politics". "The three individuals claim that they are patriots. It is not patriotic to invite any foreign leader to intervene in Singapore politics, especially the leader of a country who has declared his desire to increase the price of water to Singapore by more than 10 times, and with whom we seek to maintain close and friendly relations." The MHA letter was signed by Mr Sunny Lee, who is press secretary to Home Affairs and Law Minister K. Shanmugam. Mr Lee added that the minister stood by his comments. Earlier yesterday, historian Thum Ping Tjin, journalist Kirsten Han and activist Jolovan Wham submitted a letter to Prime Minister Lee Hsien Loong, urging him to look into the conduct of MP Seah Kian Peng and Mr Shanmugam, whom they said had made public allegations "without adequate substantiation or evidence". A separate letter, sent to MP Charles Chong, who chairs the Select Committee on Deliberate Online Falsehoods, said it was ironic that Mr Seah and Mr Shanmugam, both members of the Select Committee, "are themselves making public allegations without adequate substantiation or evidence". The two People's Action Party (PAP) politicians had criticised the conduct of the trio, who were part of a group that met Malaysian Prime Minister Mahathir Mohamad last Thursday. After the meeting, Dr Thum called on Tun Dr Mahathir to "take leadership in South-east Asia for the promotion of democracy, human rights, freedom of expression and freedom of information". Referencing that post, Mr Shanmugam had said that "it is quite clear what that means". He added that it is an absolute no-no to invite a foreign politician to intervene in Singapore's domestic politics. In their letter to PM Lee, the trio called on him as the PAP secretary-general to look into the issue and "take leadership in promoting responsible behaviour among members of your party". PM Lee subsequently referred the activists' letter to Mr Shanmugam, the MHA said, adding: "The purpose of their letter is to divert attention from the conduct of the writers." The ministry went on to recount the facts in this saga, noting that the trio met Dr Mahathir, along with political exile Tan Wah Piow and graphic novelist Sonny Liew, last Thursday. The MHA said: "(Dr Thum) invited Dr Mahathir to address a conference about promoting democracy in South-east Asia, which obviously includes Singapore. Dr Thum also posted a photo of him presenting his book, about politics in Singapore, to Dr Mahathir. "Mr Tan, a former Singaporean and a fugitive from the law, gave an interview after the meeting, also expressing the hope that Dr Mahathir and Malaysia could influence politics in Singapore. "Mr Wham has asked 'what's wrong' in Dr Thum asking Dr Mahathir to bring democracy to Singapore, and that 'international political pressure is part of activism'. "Dr Thum also believes that Singapore should be part of Malaya." The MHA response also cited an Aug 9, 2016 post in which Dr Thum declared it was his "fervent wish" that Singapore "will one day return to our rightful place alongside our brothers and sisters in Malaya". "This statement was made on Singapore's National Day. He has also made several other posts, to similar effect, about Singapore being part of Malaya." The MHA statement concluded: "We can have vigorous debates within Singapore about our own affairs. But you cross a red line when you invite foreign powers or foreign leaders into Singapore politics." Dr Thum and the others in the group have come under fire from netizens after Mr Seah wrote in a Facebook post last Saturday that the historian invited the Malaysian Prime Minister to bring democracy to Singapore, and that "it appears quite clear to me that PJ Thum does not wish Singapore well". Mr Seah also criticised Dr Thum for suggesting that Singaporeans should rejoice on Malaysia's national day, which he termed as Singapore's "unofficial independence day". Dr Thum was said to be referring to founding Prime Minister Lee Kuan Yew declaring on Aug 31, 1963 Singapore's independence from British rule, as part of a move to join Malaysia. The activists, for their part, said in their letter to PM Lee that there was "no reference to bringing democracy to Singapore, nor any request to interfere in Singapore's affairs". They added: "It is a huge stretch to suggest that wishing Singaporeans a 'happy unofficial independence day' is tantamount to expressing an opinion that Singapore is a part of Malaysia today." They also said Mr Seah's comments had the effect of inciting accusations of treason. There have been calls for their arrest, detention and even death, they added. In response, an MHA spokesman said yesterday that anyone who receives death threats should make a police report and the matter will be looked into. I am quite amazed that political activist Jolovan Wham readily admitted that his meeting with Malaysian Prime Minister Mahathir Mohamad amounts to a "seditious vacation" (No harm in asking foreigners to influence local politics: Activist; Sept 5). The Singapore Sedition Act is a statute that clearly prohibits seditious acts and speech, and the printing, publishing, distribution, reproduction and importation of seditious publications. Mr Wham's intention in meeting with Tun Dr Mahathir is irrelevant, quest for improvement in our country's democratic processes or applying political pressure on our Government notwithstanding. The Sedition Act is not partial to intention. Collusion with a foreign power in order to bring down any government is an anathema in all jurisdictions. Just look at the intense scrutiny that Special Counsel Robert Mueller is applying to the 2016 United States election, where collusion is suspected. Democracy is of our own people and from our own people. We did not struggle so hard to free ourselves from the colonial yoke only for activists to now sit down with political personalities who have openly declared stark hostility towards Singapore for whatever disingenuous reasons they may have. As a layman reading the debate over historian Thum Ping Tjin's meeting with Malaysian Prime Minister Mahathir Mohamad, I cannot help but notice one glaring detail - Dr Thum was virtually unknown among Singaporeans before the public hearing by the Select Committee on fake news (MHA responds to activists' letter of complaint to PM; Sept 6). The fact that he delights in starring in eyebrow-raising controversies, whether during the public hearing or his recent visit to Malaysia, shows that the whole episode was a deliberate act to draw publicity and attention so as to portray himself as a victim rather than a villain. However, his dubious gesture of inviting Tun Dr Mahathir, a controversial figure himself who is critical of Singapore, to "bring democracy to the region" may have backfired and appears to have caused great consternation on the ground. By implying that Singapore is less than democratic, he has inadvertently cast aspersions on the intelligence of the majority of Singaporeans who exercise their voting rights at the ballot box at every election. We may have our grievances, but Singaporeans are educated enough to separate the wheat from the chaff and understand the lines that should never be crossed. This circus act has only served to galvanise Singaporeans and allow them to sieve the fake from the truth.